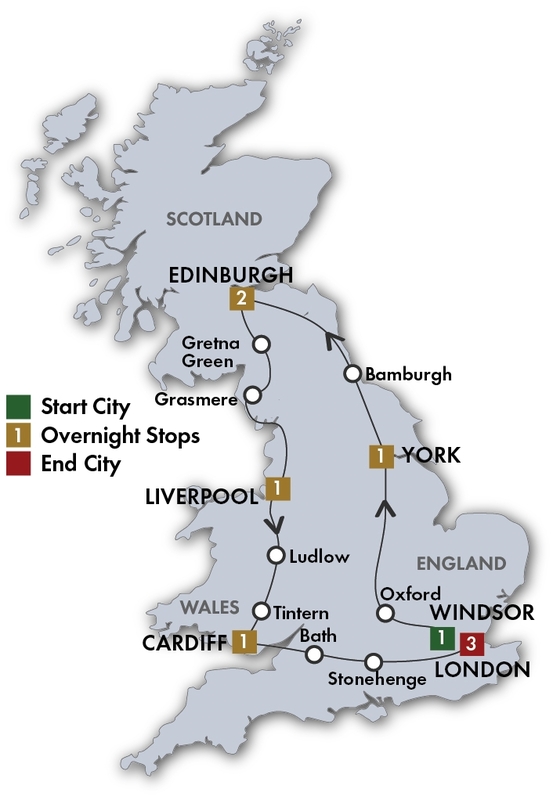 CIE Best of Britain Tour - CIE Tours International tours. Lowest Prices! Reserved seats for the Royal Edinburgh Military Tattoo on August 4 – 18 departures. Discover the rich history of Windsor and York on walking tours around these charming old towns. Visit the medieval Bamburgh Castle and enjoy views of the beach below. British Music Experience The British Music Experience is the newest addition to Liverpool's colourful music offering, moving to its permanent home in the first-class passenger lounge of the iconic Cunard Building. Edinburgh Castle The rock on which today’s castle stands has been a stronghold for over 3000 yearsand Edinburgh Castle has dominated its surroundings for centuries. See the 12th century St. Margaret’sChapel, the monumental great hall of James IV, opened in 1511, the Scottish Crown Jewels and the Stone of Destiny. Roman Baths Roman Baths & Pump Room Around Britain’s only hot springs, the Romans built the finest religious spa in northern Europe. This great temple and bathing complex still flows with natural hot water. See extensive remains and a Roman museum of international significance as well as the 18th century Regency influence Stonehenge is probably the most important prehistoric monument in Britain. The circle of vast monoliths date from about 3,100 B.C. and are built from bluestone, sarson and Welsh sandstone. It is aligned with the summer solstice and is believed to have been built for lunar and solar worship. Windsor Castle is an official residence of The Queen and the largest occupied castle in the world.A Royal home and fortress for over 900 years, the Castle remains a working palace today.Walk through the many courtyards to visit the magnificent staterooms and St. George’s Chapel. 9 breakfasts (B), 1 lunch (L), and 3 dinners (D), including a Scottish evening at Dalhousie Castle in Edinburgh and a festive Welsh banquet at Cardiff Castle. Tour begins 2:30 PM at your Windsor hotel. Visit Windsor Castle, residence of the Queen and the largest inhabited castle in the world. In the evening, join your group for a welcome drink before dining independently. Take an evening walk around this compact and historic town with a local guide.